Dwell and Design Within Reach (DWR) proudly announced the winner of their Live/Work Design Contest at the 7th Annual Dwell on Design in Los Angeles. Out of 587 submissions, five finalists were announced earlier in June, and ultimately, Dwell and DWR editors named Amanda Ip's Innermix Desk the best solution to their home-office challenge. A clear desk, a clear mind—Ip's Innermix design features recessed cubbies to store office supplies so the desktop stays uncluttered. Dimensions are 60"W x 24"D x 29"H.
Here's a rendering showing the open hidden compartments. Ip's winning design offers a clean, organized work area that is modern and fun. 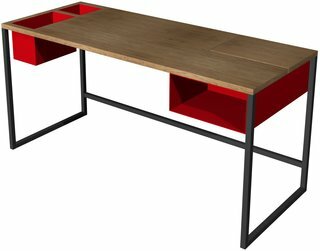 Meeting the demands of both form and function, the Innermix Desk is simple and playful with a large, solid wood workspace and smart storage solutions like an open hanging metal storage compartment and spots for pens, pencils and small office items. A concealed storage space lifts from the side to keep all the extras you want out of sight. When asked what inspired her to create the piece, Ip replied, "I thought about how I like to work. I'm usually super organized…so I basically wanted to create something really simple. I think a lot of times, designs are over thought, and they don't end up functioning well. In the end, it needed to be simple and clean, while also allowing you to work well and be organized in your work space." 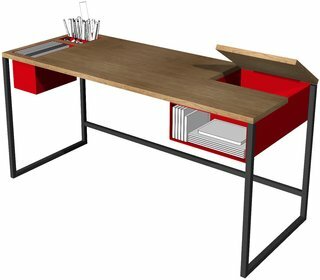 DWR hopes to put the Innermix Desk into production next year.